Note: Last week I posted a critical review of Neil MacDonald’s new book, and I invited him to respond. So he has kindly written this detailed reply. 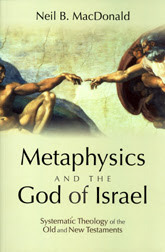 I would like to thank you very much for your review of my Metaphysics and the God of Israel, and for the responses to the review and the book. Having now seen the stream of responses, I should say from the outset that I have absolutely no problem with the kind of criticism directed toward what I have written! It would be kind of hypocritical to write a book of this kind and not expect – indeed, not want – its fundamental hypotheses to be subjected to criticism Popperian-style. If the main claims of the book are deficient then we must come up with something better. I would rather think in terms of defending my little book rather than defending myself. I don’t mind being criticized at all (my wife does it frequently), but when it comes to my little book I feel I must step in. So when I reached the point in your review where you speak of finding the book “a little disappointing and a little unconvincing,” I felt its honour should be defended. Interestingly, it was the very same matter that seemed to worry Professor Stephen Webb most in a recent review (so you are in good company). You say that concepts in dogmatic theology ought to have “real explanatory power” (material explanation) rather than operate in the realm of “tautology.” I couldn’t agree more. So let us look again at what I say. Let me take up one of my central examples of divine self-determination at work: God determined himself to be the one who created all things; therefore he is the one who created all things; therefore, the (this) world was created by God. Is this a tautology? I don’t think it is. I don’t think this can be said to be a tautology or not to satisfy the criterion of material explanation. There is a simple reason for this. The initial proposition involves a verb describing an action: (a) God determining himself, and (b) determining himself in a particular way, usually an action described by a uniquely identifying description. It certainly would have been something more akin to tautology had it not involved an action-descriptor. Suppose I had said “Jones is six feet tall; therefore he is over five feet nine inches tall” – or better: “God is the creator of the world; therefore, the world was created by God”; then we would be in the realm of mere logical consistency. That our language here is elevated to the level of verbs rather than adjectives makes a fundamental difference here. I agree with your example – “All men are cabbages; Socrates is a man; therefore Socrates is a cabbage” – but I don’t think it is relevant. We know it is not true that all men are cabbages (because we know some that are not) – so none of us would wish seriously to discuss this argument, whether or not it is valid. On the other hand: if the premise of my book’s particular argument in Part I is true then the ensuing inferences, implications, and conclusions are I think interesting. The point is this: if my argument is logically consistent then clearly divine self-determination would be an explanation of the world – if divine self-determination as regards satisfying the action descriptor “the one who created [verb: always look for the action!] the world” is true. And it seems to me it is worth considering whether it is true, because then it would be the explanation of, e.g., the world (but only if the argument is logically consistent of course!). Another way of putting the same point is: supposing that the very world in which I breathe, eat, sleep and so forth had come into existence by God determining himself to be its creator – what follows from this claim? Initial answer: I can say that the world in which I breathe, eat, sleep, etc, was created by God (Israel’s God). I can say it. And I can say it rationally and without any kind of timidity in the face of non-Christian intellectuals! (I can say more of course, and I will come to this). To paraphrase something Hans Frei said in a review of Eberhard Busch’s biography of Barth: a theologian is about imaginatively re-describing the biblical world in such a way that it comes to be recognized or at least taken seriously as the very same world in which we live. As I said, Stephen Webb’s review makes a similar criticism when speaking of the argument: God determined himself to be in our time; therefore he is in our time; therefore our time has God in it. He says this is a tautology. It isn’t. “God is in our time; therefore God is in time” – this is a tautology. What I have above is a material explanation. If God is in our time, how did he get there? Possible answer: he determined himself to be in our time (here we have an action sentence). But there is another issue. We have to decide whether this is divine self-determination without natural theology or divine self-determination with natural theology. Granted that God determined himself, which specific instance of self-determination took place? I ask this because I don’t think we can say that divine self-determination necessarily excludes natural theology: “God determines himself to be the creator of the world” is clearly compatible with natural theology (e.g. “God determined himself to be the creator of all things in accord with his nature”). “If we were to represent the world in terms of a package, we could imagine it to be stamped with the words ‘created by God’. But note well: the stamp itself tells us nothing about the package itself other than the fact that it was created by God. It tells us nothing about the package itself, regarding its contents, for example. In other words, the stamp tells us nothing about the natural properties of the package. The stamp acts simply as a designator, not a description” (p. 33). “Crucially then: we cannot infer from the natural properties of the package to the claim that it was created by God. The natural properties of the package are not the reason that the package is stamped with the words ‘created by God’. What explains the stamp is that God determined himself to be the creator of the package. Nothing more and nothing less” (p. 33). In order to explain this concept, in Part I of the book I invoked a thought experiment of two identical worlds – identical in terms of natural processes and laws – only one of which God has created. If this was possible, and if it turned out that our world is the one created by God (as it is obviously in the book), then our world is a world in which any kind of natural theology – be it based on motion, cause and effect, gravitational constants, etc. – is impossible. Our answer to the question, whether “all things” is truly designated by the predicate “created by God” can only be based on the answer to the question, whether God has determined himself to be the creator of all things. This and this alone. It is creation “from above” rather than “from below.” Moreover: according to this account, God does not act through his nature (if he has one), but he acts as a divine self-determining person. It is a kind of “neo-Chalcedonian” account of divine action, and of creation in particular. Now from the point of view of this analysis, the reason there cannot be an identical world not created by God is that this world created as it was by God has God’s character flowing through it, in the sense that it is the effect that the cause would naturally produce were it to produce a world. And since God’s nature has a sui generis character, there can only be one such world. For Aquinas, then: no identical world not created by God. Nevertheless, we can see how natural theology is entirely plausible: God’s nature continues to function as a description of the nature of the world in virtue of Aquinas’s analysis of causation. It is not a mere designator! Of course, I am inclined to think I cannot accept Aquinas’s analysis of causation because it presupposes natural theology. So my analysis of divine self-determination without natural theology does not presuppose Aquinas’s analysis of causation! In fact it really only presupposes that God is a person, not that he has a nature. That is, even if God has a nature, it is not relevant to the nature of the world. God does not require a nature to act. As to the question whether God has a nature, I will only point out that Claus Westermann makes it clear that, in creation, the people of Israel only identify God in his acts and do not presuppose a being as it were behind the acts. But let me end, Ben, on your fascinating thematic point of departure from which you launched your review. You say that you have been “thinking a lot lately about the relation between nature and grace.” If I were asked to say where the historical precedent for my view of divine action lies, I would say it lies with Luther. Think of Luther’s claim on God as the promising divine identity who promises us forgiveness of sins and, by extension, the gift of eternal life. Without going into the details of Luther’s thought on this matter: suppose I believe myself to be precisely the one who has been promised eternal life in this way. If this is true, then God has promised me the gift of eternal life – which means that my belief is true. But now suppose an identical world in which I exist but God does not. In this world, I also believe that I have been promised the gift of eternal life. But it is not true, I am wrong. But of course the two worlds are identical in this regard. There is no difference as regards my “ontic” status between one world and the other. This is of course not true in Aquinas’s world as regards grace. 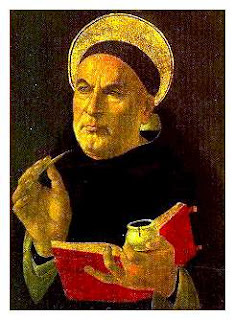 For Aquinas, in the world which God created and in which I believe I have received grace, I receive an “ontic” infusion of grace. In the world which God didn’t create (and which doesn’t exist) and in which I believe I have received grace, I do not receive an “ontic” infusion of grace. So for Aquinas, the worlds are not identical. Daphne Hampson’s book, Christian Contradictions, speaks of a distinction between Catholic (Thomist) and Protestant (Lutheran) approaches to grace in terms of an “ontic” model and a “status of relations” model. What I have to say corresponds to these two different kinds of models. I found her book very illuminating and, after I had finished the Metaphysics book, it made me think of writing a kind of sequel, placing the work in the historical context of the contrasts between the Thomistic and Lutheran visions. So there are these two great – perhaps irreducible – theological traditions, and I belong to the tradition of Luther, Bultmann (think of his undemythologisable analogical understanding of divine action), and Barth.